1. Updating the IP address in the Control Panel. To change the IP for the WHM/cPanel follow the below steps. Using an SSH interface like PuTTY you can connect to your VPS server. Update the following command in you control panel license. Go to Home>>Main >> Sever Configuration >> Basic cPanel and WHM setup menu and click on All Tab. To set up the Shared Internet protocol virtual host, the ‘IP address‘ field is used. Enter the new Internet protocol address in the ‘Basic Config‘ section at that time save the changes. Go to Home >> Main >> Account Functions and change the IP address of the site so that the added user sites’ IP is updated. After selecting the ‘User‘ then click on ‘Change‘. From the drop-down menu select the new IP address and click ‘Change‘. Repeat this procedure for every newly created user. By filtering the users using the User Name or the Domain name using the account search function this process can be speeded up. The following step exhibits how to change the IP address for the private name servers (NS) of your specified DNS server. Come on Home >> Main >> Server Configuration >> Basic cPanel & WHM Setup menu and click on All Tab button. At this juncture beneath the ‘Nameservers‘ section change the Internet protocol address and click save the changes. 3. Update the A Record. Below are the steps to update the A-records for the prevailing zones in the DNS on the WHM cPanel. 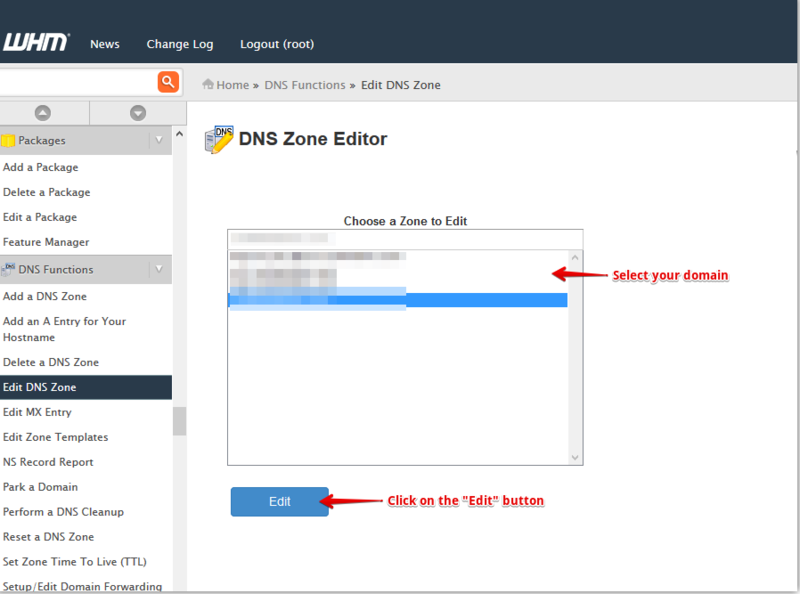 Come on Home >> Main >> DNS Functions >> Edit DNS Zone menu. Select the ‘Domain‘ and the ‘Edit‘ button. To the A record apply the new IP address. This procedure has to be repeated for all added domains.